A lot has been written about James Stirling and his journey from modernism of his ‘red buildings’ to postmodernism of No1 Poultry and since I lived through this rollercoaster period, desperately trying to follow these inexplicable twists and turns, I think time is ripe for me to look back and attempt to discern some hidden logic for this strange journey. Understanding some of the personal traits of Big Jim, and reading anecdotal tales which abound, attempting to discover any linear development where there is a predetermined slot for all his creative activities would be futile. There is no doubt that he was a brilliant designer, who always guarded his ‘creativity’ against any attempt to stop him reaching his clear goal of the end product, which he always crafted after thoroughly studying the given brief and context. Any attempt by the clients to change any aspects of presented design was never well received. This I discovered did not happen only after he acquired an international reputation, as Jim was equally hostile to even minor suggested changes on his very first scheme at Ham Common housing in late 50s. It is said that the staircase leading to Jim’s office were lined with letters of complaint and dismay from clients and users of buildings and displayed proudly as badges of honour giving ample warning to any unsuspecting newcomers. I am of the opinion that two closely spaced events may well have been the precursor of a major shift in the direction of his creative process; one was buying Thomas Hope’s furniture and second was to employ Leon Krier. These events coincided with the period when he was involved with Olivetti towards the end of 60s and early 70s. 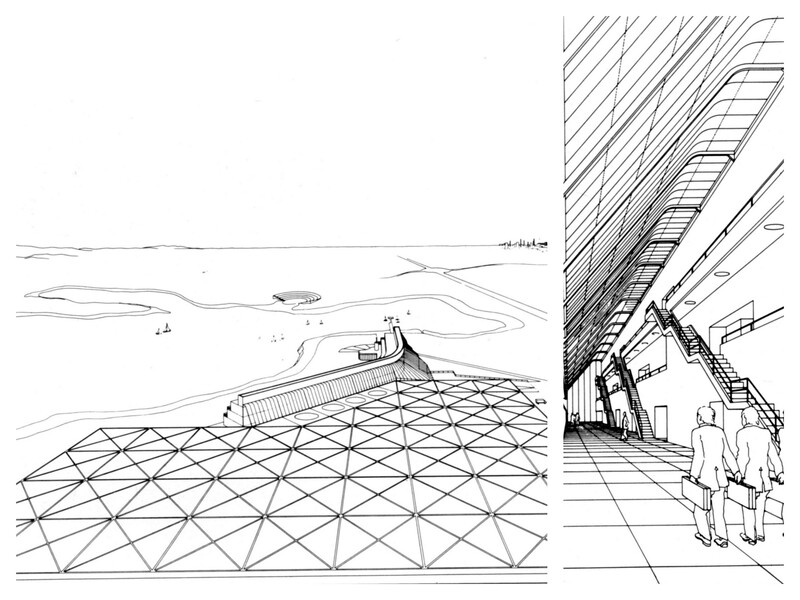 Colin Rowe draws our attention to a perspective drawing (I think that there were at least two) that Leon Krier drew in 1971 for James Stirling’s un-built Olivetti Headquarters at Milton Keynes. This drawing was meant to be homage by this young draftsman to his master, hinting at his interests in Thomas Hope’s furniture and also history. Stirling sits in his beloved chair, slightly outside the frame of the perspective, with an open book at the table in front, assumed to be a volume of Le Corbusier’s Oeuvre complete. Leon Krier depicts himself as a classical bust looking at the whole scene. Jim is ticking off some young office junior, who, judging by his body language could not care less. The style of drawing is reminiscent of Le Corbusier and also various other 19th-century neoclassical architects Jim acknowledged being influential for him. Thomas Hope also produced engravings in this style for “Household Furniture” showing neoclassical furniture. 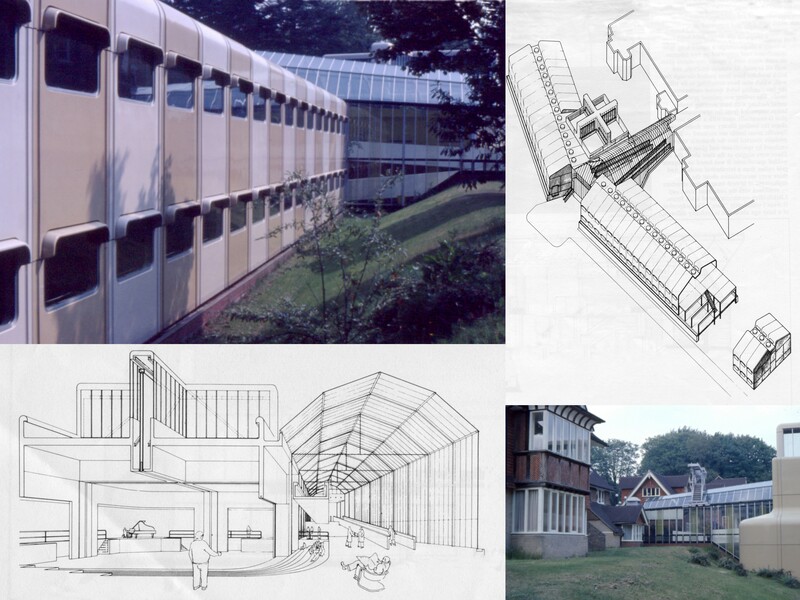 Olivetti Training Centre project came to Stirling on recommendation of Kenzo Tange. 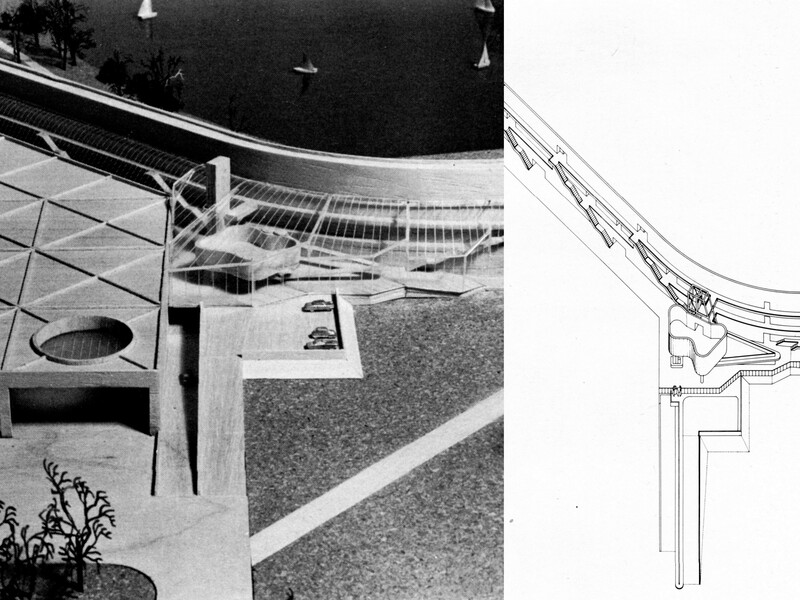 I feel that Scarpa and Corbusier’s previous connections with Olivetti would not have gone unnoticed by Jim. Edward Cullinan was asked by Jim to take care of the renovation of the existing Edwardian building and he started to work on the design of the new wing. This was to be his first and the last project where the design is influenced and inspired by clients work. It must be remembered that at that time Olivetti held a place in industrial design world not dissimilar to ‘Apple’ today. Their streamlined colourful injection moulded products were trendy and coveted items. It is interesting to note that this is one of the few projects from Jim’s office where the building failures and defects of the completed projects have not been brought in the public domain. It is possible that these were not present or it can be assumed that a well-off corporation would quietly take the appropriate steps to resolve any problems as these arose. After all, for them to have a building designed by an international celebrated architect was like a prize business card. The design of Headquarter building in the new city of Milton Keynes followed the completion of the Training Centre. Unfortunately the computer age had greatly undermined Olivetti’s market position and the HQ was never built. 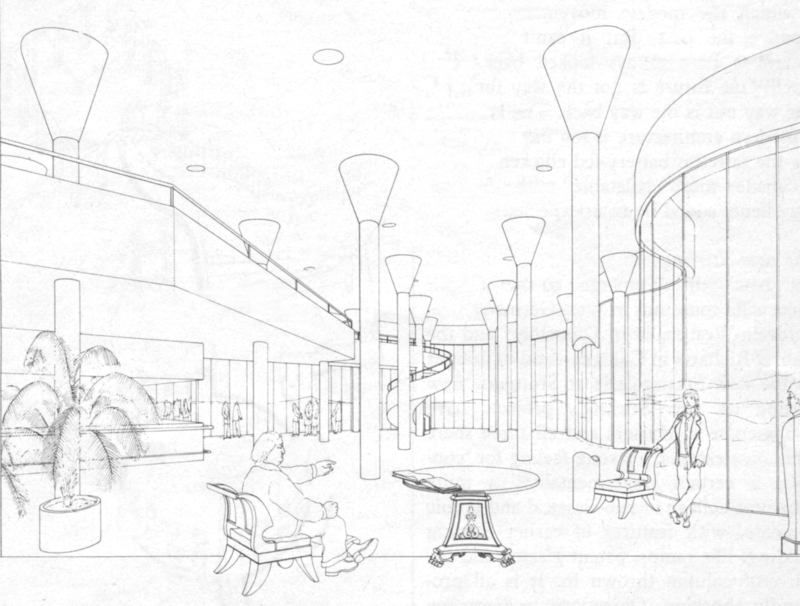 It is clear that this time Stirling firmly decided to steer away from client product based design and went back to his own familiar way of using various historical and contemporary references to other architects and his own buildings. He thought the impeccable quality of the lines unify the disparate elements represented, helping the viewer to apprehend the underlying qualities that unite a chair by Thomas Hope with Stirling’s design for the Olivetti Headquarters at Milton Keynes. Was this drawing ‘watershed’ announcing the arrival of “Postmodernism” in Stirling’s work? I enjoyed looking at your photographs of red buildings. Thanks.